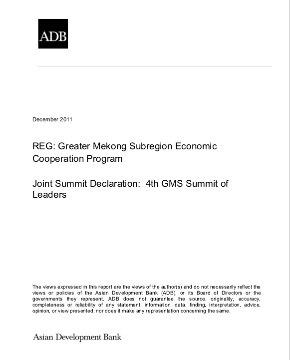 The 4th GMS Summit of Leaders was held in Nay Pyi Taw, Myanmar on 19–20 December 2011. The leaders of the six countries of the Greater Mekong Subregion issued a joint declaration, entitled "Beyond 2012: Towards a New Decade of GMS Strategic Development Partnership." They agreed on a new 10-year plan to boost growth, development and poverty reduction across the subregion. They endorsed a strategic framework for 2012 to 2022 that calls for a range of new measures to strengthen regional cooperation, including more effective resource utilization and more careful balancing of development with environmental concerns.